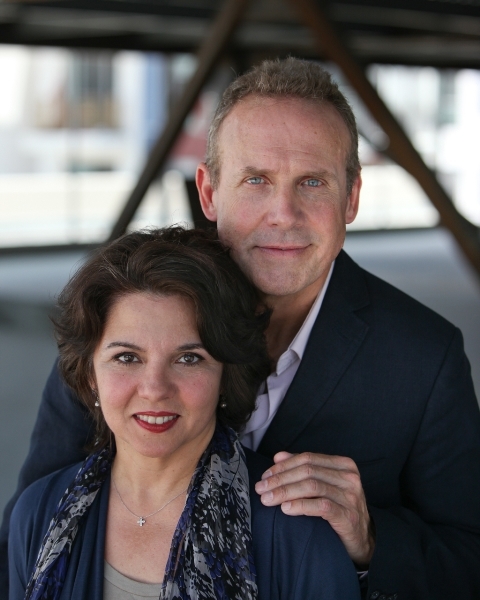 The Blank Theatre opens its 26th season with a new work written and directed by founding artistic director Daniel Henning that explores one of the most controversial events in U.S. history – the assassination of President John F. Kennedy. The Tragedy of JFK (as told by Wm. Shakespeare) is the result of several decades of research during which time Henning has come to be recognized as an authority on the subject. That, combined with his other great obsession – live theatre – meant it was only a matter of time before LA audiences would see a stage play based on his work. It isn’t the first time a political leader’s life has been cut short by opposing forces. JFK’s story bears uncanny similarities to another ruler who lived more than 2,000 years ago during the Roman Empire. Julius Caesar’s death at the hands of a group of conspirators would prompt another playwright in England – William Shakespeare – to write his own story of the machinations of men, The Tragedy of Julius Caesar, in 1599. Though separated by thousands of years, the two men do seem eerily connected, with one important difference. The public knew who killed Caesar, but JFK? That’s a whole other ball of wax. Although the Warren Commission, tasked with the JFK investigation, would find that Lee Harvey Oswald acted alone in gunning down the president, conspiracy theories abound. There were many who had something to gain by JFK’s death. Henning connects the dots in a way that rids the story of its misinformation and draws compelling conclusions about the events (by way of theatrical exploration) that are hard to deny. To tell the story, he uses much of the Julius Caesar text, skillfully merging our historical characters and their Shakespearean alter egos. The cadence of the contemporary regional accents and classical verse works well together as does the straightforward tone of the piece. Henning strips away all distractions and focuses in on what is said and who is saying it. In doing so, the parallels between characters like Caesar and JFK (Ford Austin), Brutus and LBJ (Time Winters), Cassius and J. Edgar Hoover (Tony Abatemarco), or Marc Antony and Bobby Kennedy (Chad Brannon) become chillingly apparent. Abatemarco’s Hoover is a cunning creation whose resentment of JFK is obvious from the very beginning. His Machiavellian overtures come couched within an oily persona that only becomes more disgusting with every wonderfully vile speech he bites into. We love to hate him. 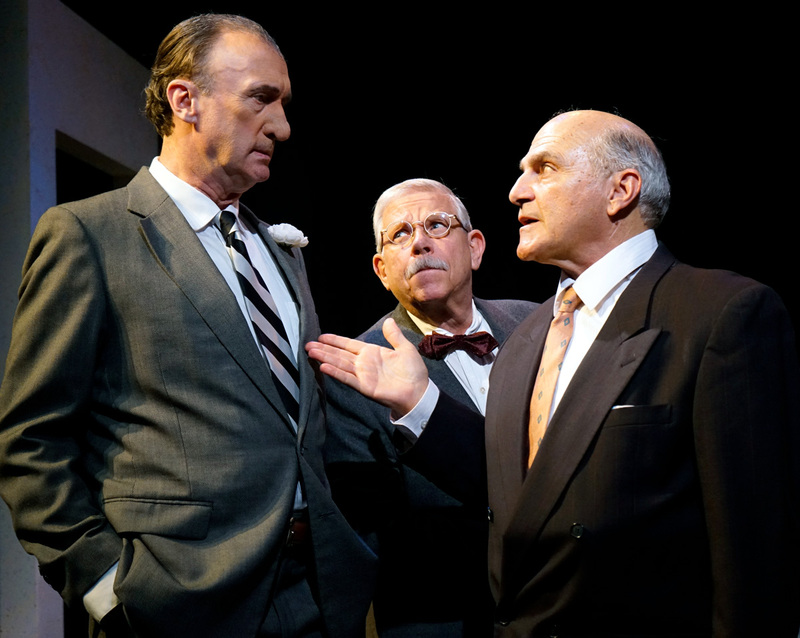 As Lyndon Johnson, Winters presents a meticulous portrait of a man of ambition who will not be underestimated. He is a commanding presence amid the players and uses intimidation as it suits him. Austin captures JFK’s effortless charm in passages like the “I will not come” dialogue after Jackie (Casey McKinnon) warns him not to go forth today (the same warning Shakespeare’s Calpernia gives Caesar before he is assassinated at the Senate). McKinnon is a gentle Jackie, full of grace, with a stunning resemblance to the first lady. Brannon’s two best moments, the “Cry havoc” speech and his “I come to bury Caesar” diatribe full of thinly-veiled malice, resonate deeply. 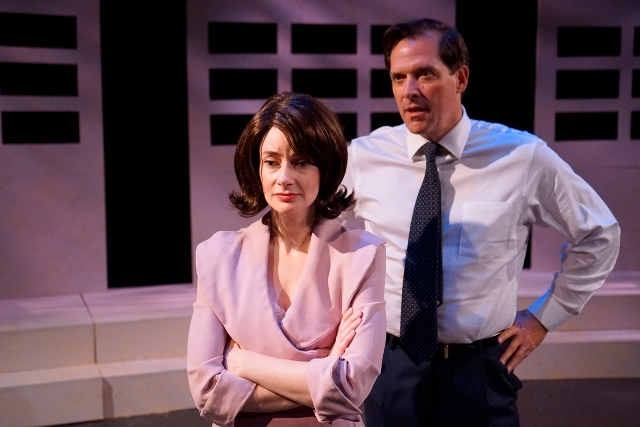 The entire cast is equally as skilled, with additional notable performances from Susan Denaker as Lady Bird Johnson and Brett Collier as Martin Luther King, Jr. The timeline of the play covers the events leading up to the assassination and the fallout that follows it, reaching its climax during a powerful scene recreating Dr. King’s march from Selma to Montgomery, Alabama. A lyric revision turns the civil rights anthem “Ain’t Gonna Let Nobody Turn Me Around” into an emotional high point creating a kind of false ending before the play moves on to LBJ’s presidency, his decision not to run for re-election in 1968, and the events at the Ambassador Hotel that same year when Bobby Kennedy would be shot. An uncomplicated technical design benefits the production by keeping the audience’s attention riveted on the characters. Historical footage projected on the set is the lone obvious enhancement that introduces theatricality to the overall effect. It’s beautifully done. 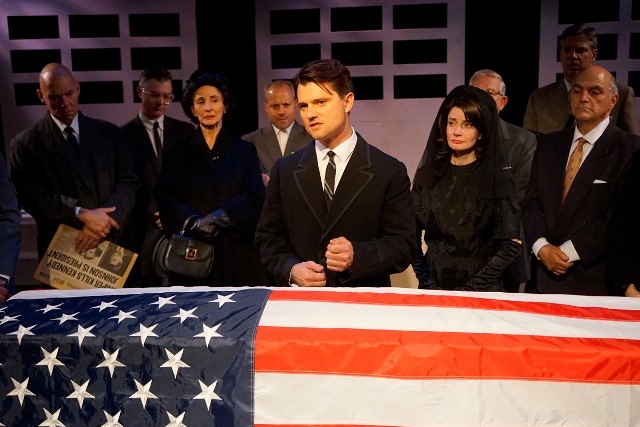 The Tragedy of JFK presents a compelling explanation for one of the most horrific events in U.S. history and Henning’s production contains some of the finest work you’ll see on a stage in LA. This is an exceptional cast telling an extraordinary story and one of the best nights of theatre you’ll see in 2016. CASA 0101’s production of Julius Caesar directed by Robert Beltran continues its run through Nov. 16. There will be no performance on Halloween, Friday, Oct. 31 however an additional performance has been added on Monday, Nov. 3 at 7:30 pm. Julius Caesar is presented on the theater’s Main Stage located at 2102 East First Street (at St. Louis Street), Boyle Heights, CA 90033. For a complete schedule of dates and more information visit www.casa0101.org. 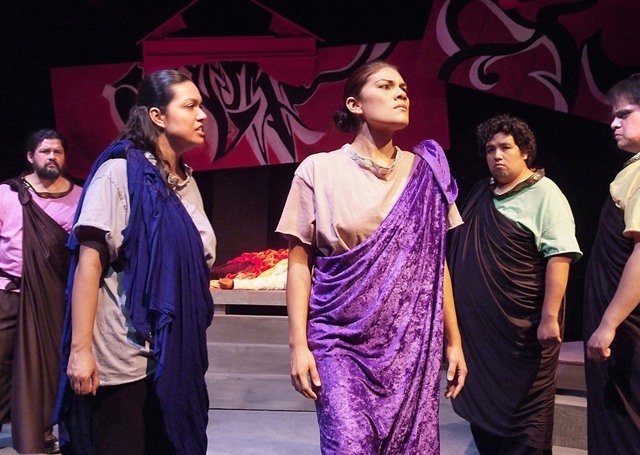 CASA 0101’s Julius Caesar is part of Encuentro 2014, A National Latina/o Theatre Festival. Concurrently with the run of the show, an Art Exhibit featuring the work of Arturo Urista will be on display in the Jean Deleage Art Gallery in the lobby of CASA 0101 Theater. The Exhibit features works dealing with themes presented in the play. 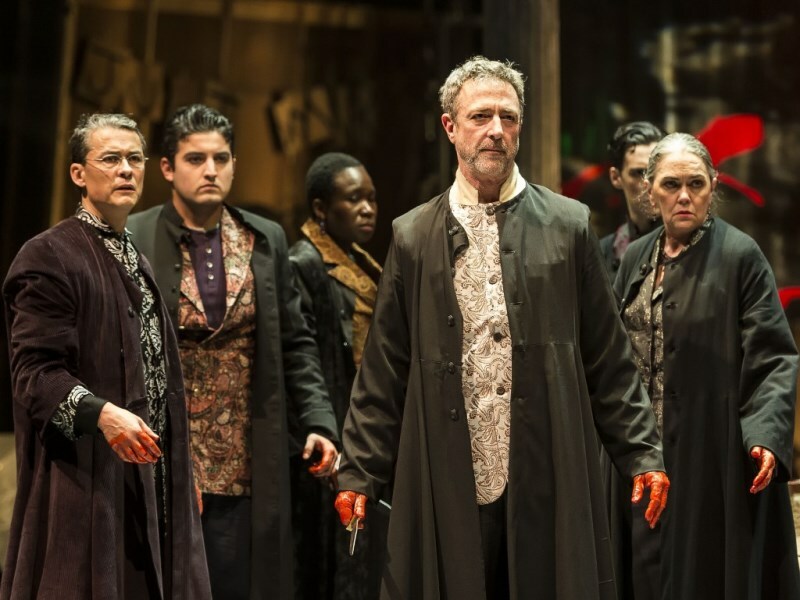 CASA 0101 Theater will present Shakespeare’s Julius Caesar October 17 – November 16 as part of the Encuentro 2014 National Theatre Festival. 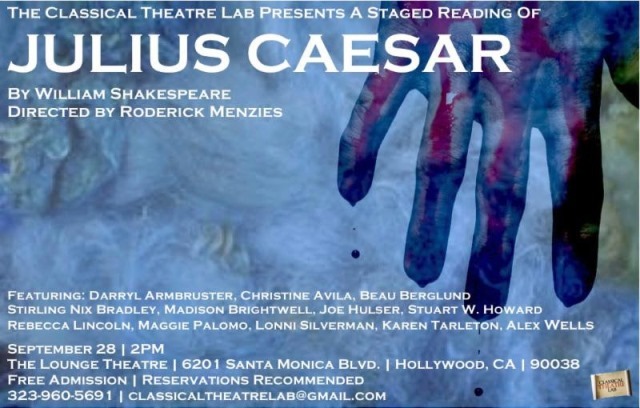 Directed by Robert Beltran (Star Trek: Voyager) and presented in English, Julius Caesar explores the human motivations behind the betrayal, assassination, and the aftermath of Caesar’s death that precipitated the end of the Roman Republic and the birth of the Roman Empire. The cast includes Lauren Ballesteros, Uvaldo Baltazar, Emmanuel Deleage, Joshua Duron, Fidel Gomez, Rachel Gonzalez, Jasmin Iraheta, Karlo Ishibashi, Ted Lange, Linda Lopez, Carmelita Maldonado, Daniel Mora, Ray Rios, Moises Rodriguez, Miguel Roura, Vance Valencia and Katie Ventura. 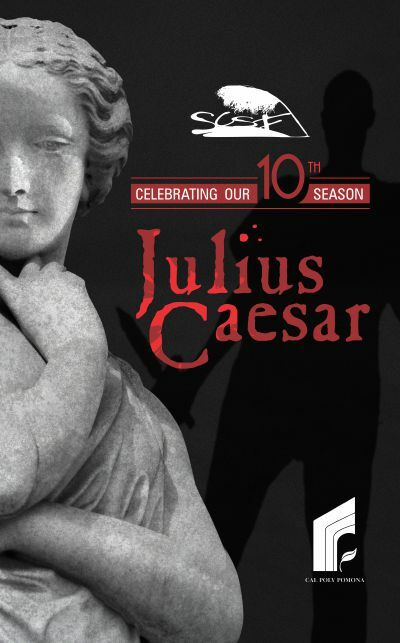 Julius Caesar will run Fridays and Saturdays at 8:00 pm and Sundays at 5:00 pm (no show on Sunday Nov. 9) at CASA 0101, 2009 East First St, Los Angeles, CA 90033. For tickets and more information visit www.casa0101.org. For more information about the Encuentro 2014 National Theatre Festival and all of the productions on the schedule visit www.thelatc.org. Auditions for the 2013 Season will be held 1:00 – 5:00 pm Saturday, February 16, and Sunday, February 17, at Joslyn Senior Center, 21 Grant St., Redlands, CA 92373. Call-backs will be held at 5pm Sunday, February 17. Auditions consist of cold readings of scenes from the three plays to be presented during the season. No prepared monologues are required. The season includes The Taming of the Shrew (All male cast), Julius Caesar (All female cast), and Love’s Labours Lost (Mixed gender cast).